Christian culture is not having it. They think it's nice that Catholics believe in God, but that praying to Mary is a big problem. On top of that you have the pope, confessionals, transubstantiation, and the special Catholic bible with the extra books in it. Plus, Catholics are a little too comfortable with alcohol for American evangelicals' liking. All of these factors combine to put Catholics in unsaved territory as far as Christian culture is concerned. Christian culture maintains that Catholics use rituals to earn God's favor rather than accept grace through faith. At the same time, Christian culture has its own rituals (written and unwritten) that can replace faith and keep them in the cycle of Doing Things and Avoiding Relationship. As we've discussed in a previous post, doing things and avoiding true relationship is a hallmark of Christian culture. This is SO true. Have definitely encountered the sentiment among my Protestant friends. But I do have a question a question for you Steph and other commentators out there... Who does Christian culture frown upon more: Liberals, Catholics or adamant atheists? Catholics are considered the lesser of those evils but are still viewed as sadly misguided. I concur. My first husband, a Free Will Baptist MK, told me straight that Catholicism was a religion of idolatry, firstly by putting a priest between the believer and God (which is fundamentally what Protestantism is about) but also because they prayed to statues and prayed rote prayers (chanting or repetition of stuff is frowned upon in the FWB church). I'm not sure where the whole "judge not lest ye be judged" fits in here, obviously. Mo, interesting. To hazard a guess, I'd say atheists, since that's a direct rejection. Liberals are just wrong-headed and need to be fixed and Catholics are at least in the ballpark. But that's just my guess. We don't have that problem in the same way in the UK, cos we've got Anglicans, who get on alright with Catholics and also with what we call Non-conformists, which means anyone else really so would include the Evangelicals. A lot of Anglicans would also see themselves as Evangelicals, though they may not always use a big E.
I think the biggest "enemies" are liberals, at least in the imaginations of the American evangelicals I've known. In those circles, Catholics are seen as profoundly misguided, but not as "unsaved." The thing is, there are probably a kazillion variations on all of this, here in the US. I beg to differ - I have come across exactly this view in non-conformist churches including te one I attend. My one big gripe with the Roman Catholic Church is that they exclude non-Catholics from the mass (communion to the rest of us) so we can't join together in the unity that Jesus commanded. hmmm I have to be skeptical about this one. I'm not in any postion to judge another persons soul, but there are definitely some legitimate theological differences between the ways Catholics and Protestants view faith, and God,ect. The best example of this is the fact that the catylist for the reformation back in the day was the selling of indulgences, and that they are still sold today. I'm just saying that schism is still there. Hmmm...isn't this one something of a two-way street? Doesn't the Catholic Church question the salvation of those who have fallen away from the "True Faith" and the authority of the Pope? Or is this not the case anymore? At any rate, I don't think this skepticism is only directed at Catholics. I'm Methodist and have had my salvation questioned by "evanglicals". Even more-or-less mainline Protestants still have problems with even the word "catholic." In my church (Reformed Church in America), in the Apostle's Creed, "holy catholic church" has been changed to "holy Christian church." I continue to say it the old way, the way it was written 1,900 years ago. This is especially tricky when one's own parents move to Mexico to evangelize the catholics. Sigh. I think that sometimes people dont have a clear defination of 'evangelical' christian. Just an observation. Stephy, I 100% agree. When I went on YWAM to Mexico...oh yes, I did...we were forced to march from four corners of the city upon the Catholic church (some what in the manner of the Crusader crying infidel and marching on Jerusalem? We all know what happened to those arrogant SOBs) praying for the evil of idol worship to be expelled from the city. We were warned beforehand that we would feel a heavy sense of spiritual attack and would want to sit down, once inside the church. I did feel something, of course I did...Im a sensitive. But it was no different than the sensation I'd feel in prayer in the chapel or walking into a 'haunted' house. Its shameful to try and dictate another's religion. What the heck were we praying for? In my opinion, third world countries need shoes and clean water. Education and food. Not a change of religion. And no-we didnt provide any of the above. The whole experience made me walk away from the church. I poped ten years ago, and my Baptist PK mother still thinks I only did it to get a rise out of her. But I live in Mormon country, so Catholics are considered kind of half-in, half-out by comparison. Mormons make a better theological whipping boy. We can be considered Christians as long as we look and sound sufficiently like Evangelicals. What gets me is the way the word "Christian" gets co-opted. If I say I'm a Christian, I have to clarify or I'm assumed to be Evangelical. For a while, this town had three religious bookstores, a Mormon one, a "Christian" one (read, Evangelical) and a Catholic one. Still Breathing, that's not entirely true. Our communion is open to members of any church that believes the same things about it that we do. (With a few exceptions, alas.) So Orthodox and other churches that believe in transubstantiation are welcome as far as we're concerned, although their own hierarchies may still forbid them to accept it. Honestly, would you feel right taking the communion knowing that what was being offered was radically different from what you believed you were getting? But what if it's not actually radically different from what you believe you were getting? My Presbyterian husband took communion in a Catholic wedding the other day, even though they said non-Catholics couldn't, because we worship the same God. Stephy, the difference seems pretty radical to me. We believe that it's the literal body and blood, and we share it willingly with (almost) anyone who believes the same. (Lutherans are an exception, although I hope that gets corrected soon.) Presbyterians have a higher view of the sacrament than some other Protestants, but still see it as more or less symbolic. In taking the Eucharist, your husband was tacitly affirming that what he was receiving was actually the body and blood. Which I assume he didn't really intend to be saying. The Catholic position isn't meant to be snobbish, honest. (Although I've never been able to convince my Evangelical sister of that.) But it's indicative of a certain unity of belief about the nature of the Eucharist that simply isn't there between Catholics and Protestants. I can appreciate what you're saying Joel. So here's a question: if Catholics believe that it's the literal body and blood and Presbyterians believe it is Christ's invitation to participate in community with other believers as a foretaste of heaven, which is it really? This kind of sums up what I'm trying to do with this blog. The best example of this is the fact that the catylist for the reformation back in the day was the selling of indulgences, and that they are still sold today. Hi, here is everything you need to know about indulgences, lol! Good Call on this one. I was raised an evangelical, but always was attracted to Catholicism. I went through the year long RCIA process to learn more and really understand the people that everyone critisized so heavily, even though if you go to a bible college, you'll inevetably have to read catholic writing. There are some things the evangelicals have got wrong, that they could pick back up from the catholics: celebration of the eucharist for example. As you say, most of the things christian culture like don't have much to do with Christ. Didn't Christ ask us to take communion as often as we can? I guess once every other month is as much as most evangelicals "can" do what Christ asked. I was told, growing up, that Catholics weren't Christians. My Dad had grown up in a Catholic church in an immigrant community in Michigan and said he never heard the gospel there. But then my parents made the mistake of sending me to a Catholic high school. And what did I discover there? Real Christians. So here's a question: if Catholics believe that it's the literal body and blood and Presbyterians believe it is Christ's invitation to participate in community with other believers as a foretaste of heaven, which is it really? Actually, that's a very good question. I suppose it depends on the church under whose authority it's offered. Certainly the Catholic Church would agree with Protestants who believe that their communion is purely symbolic. I think the Presbyterian position is somewhere in between, a "spiritual presence" or something like that. (I don't know that much about it.) But I don't think it's unreasonable that - since we make such a big deal of the Eucharist - we would prefer it those who take it less seriously refrain from it. Zack, indulgences still exist, but they haven't been sold since the Council of Trent. Or rather, it's forbidden to sell indulgences. If it goes on illicitly, I haven't heard about it. I suppose it depends on the church under whose authority it's offered. I personally think it's God who is the authority of the Eucharist, not a church/priest/pastor. This may be my Presbyterianism/part-time atheism speaking but that's where I am on it. In my childhood church, Catholics were kinda-sorta considered Christian, but definitely out on the margins. Anyone who (1) "prayed to statues" (read: idols), (2) had a pastor who wore fancy vestments, (2b) served as a mediator between God and his peop-le, (3) said written or rote prayers, and (4) had a ritual of confession to a priest, was definitely beyond the pale of what was acceptable. (2) and (3) also applied to Lutherans and Episcopalians, and made them automatically suspect as well, no matter how "evangelical" they might have thought of themselves. After commanding us to celebrate The Lord's Supper (Mass, Eucharist, communion or any other name) Jesus prayed "that they (i.e. all Chritians) may all be one" (John 17:21). Speaking as a Baptist I find it very sad that all Christians don't share this central act of our worship together. If the Roman Catholic Church can give a dispensation to Taize to use the Catholic mass for any who attend why not for the rest the world? P.S. My grandmother attended a mision church in Chile and she used to talk to me about "Christians and Catholics" - I was in my teens before I found out the that Catholics are Christians! Stephy, you just put your finger on one of the real dividing issues between Protestant and Catholic (and Orthodox, et. al.). Things like Mary and popes make good "OMG, those Romanists are a bunch of pagans" fodder for the Chick tract crowd, but the real underlying issue is how much authority God vests in the established church. It all comes down to apostolic succession. Protestants tend to regard themselves as co-equal with anyone else when it comes to God's authority. That is, if the Bible doesn't specifically mandate something, nobody else has the right to mandate it. Of course, it doesn't work out that way in practice; Evangelical Christianity in particular is full of unwritten assumptions. But that's the basic Protestant approach to dogma. Catholics believe that the Church - as an institution, not merely as the collection of believers - holds authority that an individual believer is bound to obey. We could argue over the Biblical evidence for that (whose soever sins ye remit...), but the bottom line is that if the Church makes a rule on something, we believe God expects us to obey it even if we disagree and are certain we're right. Here's an analogy: I have a lot of kids (eight, in fact), ranging from grown to quite small. Frequently the older ones baby-sit the younger ones. It's not unusual for a big sibling to be more strict than I would be in a particular situation. Having given the big kid the authority to speak for me, I will back him up when he gives an order. If he goes too far I may correct him privately later or even relieve him of babysitting, but I won't contradict a babysitter for anything short of serious danger. God does the same thing with the Church. If my priest tells me to go jump in a lake, he may well be wrong to do so and God will be displeased with him. But God will be just as displeased with me if He doesn't find me dripping afterward. Side note to Still Breathing: The Church didn't give a dispensation to the Taize community to share the Eucharist with non-Catholics. The local ordinary made the decision to allow Br. Roger individually to receive the Eucharist. It was (as far as I know) the bishop's call to make from his apostolic authority. I wasn't aware the evangenlicals looked at Catholics this way. But to be honest, a lot of Catholics look down on Protestants, especially the Evangelicals. Some of the more flamboyant sects like Pentacostals do all that crazy jumping in the aisle, screaming, faith healing crap. Its so flamboyant and over the top it makes us Catholics snicker. Also, many of them take the Bible literally, something Catholics think is ridiculous. How Protestants manage to believe every word of the Bible with its parables and endless contradictions mystifies me. It seems like Bible literalists are constantly missing the forest for the trees, and I hardly ever encounter any that understand the historical context the Bible was written in. It doesn't matter. To them the Bible is a static rulebook that has all the answers. Also, just look at the requirements necessary to be a Catholic priest. Four years of college, and then at least four more years of advanced study. More for the Jesuits. That means Catholic priests basically have a PhD. I have no idea what it takes to be a minister at the Greater Ebeneezer Missionary Baptist Church, but I'm pretty sure all you have to do is read the Bible and then learn how to scream and whip your audience into a frenzy. Wow I can't believe how many people were raised to believe Catholics aren't Christians, considering that Catholics were the original Christians, and that Catholicism was synonymous with Christianity until the reformation. I was raised Catholic, went to Catholic schools, was an altar boy, and I was always told that Catholics were Christians. Never heard anything growing up about Protestants not getting into heaven. If you think that Catholics tend to keep God at arms length through their rituals, recited prayers, and solemn masses, you are probably right. To Catholics, God is the unknowable, the Alpha and Omega. God is a deep mystery unapproachable by the human mind. Also, Bible study is not as important to Catholics as it is to Evangelicals. I remember on the first day of my Old Testament class in high school, the priest grabbed a Bible off a kid's desk and chucked it as hard as he could against the wall. He yelled "Its just a book gentleman!" The point he later elaborated on was that the Bible is a historical chronicle of our feeble human attempt to understand God. And the alcohol . . . OK one thing I do have to say about Catholics is they do like to drink. Jesus' first miracle was turning water into wine so everyone could have a good time. What's wrong with that?? One criticism I never understand from Evangelicals is that us Catholics "don't use the bible." If you know the bible and have ever been to a Catholic mass, you know how absurdly false that is. Not only do we have 4 readings right off the bat (1st reading, psalm, 2nd reading, Gospel), but the rest of the mass is chock full of biblical references (e.g. "Lord, I am not worthy to receive you (Matt 8:8)). As a Catholic, who has 16 years of formal Catholic Education, I have never been taught to make fun of or insult another person's faith. This is a value that the posters on this page clearly lack. The condemnation of other religions many express perpetuates a negative stereotype of Christians that breeds hate and mistrust. Before you comment about a religion make sure you know what you are talking about... because most of you come across as uneducated and unintelligent. And the alcohol . . . OK one thing I do have to say about Catholics is they do like to drink. I consider it a trade-off for having to put up with dull homilies and appalling hymnody. We may not be able to sing or preach, but at least we can swill! Neener neener! You said Catholics aren't Christian. I have no problem with anyone criticizing Catholics, but not by redefining the word christian. I think the phrase you are looking for is "true christian". Jesus clearly had issues with the religiosity going on around Him. We all know He rebuked them time and time again. But this blog isn't a rebuking by any means. Part of rebuking is showing a person where they're wrong, and helping them repair the issue. Never does it include mocking that person. This blog, and many of its posters seem to be doing just that. We are supposed to love the bride of our Christ, to build her up with the gifts He has given us. This blog does nothing of the sort. And although many of your writings, and the posters' writings are incredibly humorous, it is only tearing apart the unity that Christ desires. I think we can all agree that out of our continual religious nature, all who consider ourselves Christians do some pretty freaky stuff in the name of Christ, but that is no reason to criticize Christ's bride. Anonymous, This blog points out where we have muddled our culture with the true way of living as the Bride of Christ. If that's criticism Im al for it. Joel, My (Baptist) minister was at Taize last year and recognised the Catholic Mass being used for everyone. He asked one of the brothers about this and was told they have a special dispensation to to this. His, and my, point is if there why not everywhere as Jesus commanded us? I walked into Lifeway Christian books once to get a confirmation gift for my kid (Episcopalian). I asked for a copy of Lives of the Saints. The looked at me like i had asked for a copy of Necronomicon for Kids. Oy. I eventually settled on a KJV with the flexible cover. I asked about getting my kid's name engraved, and the clerk replied that there was a waiting list for that because of graduation, and that the guy who did it wasn't there. So I asked if he knew how to run the machine. He did, so I said "How about I slip you a ten to go back there and put my kid's name on this book?" Again he is looking at me like i am evil incarnate. He refuses. So I go up to pay, and I ask the sweet woman behind the counter if she knows anywhere where i can have this done pronto. She whispers that she will do it really quick. So now I am waiting up by the register, and the dude sees a line start to form by the empty register. I can tell he is not a register kind of guy. He prefers to straighten the merch and spread the good word with the customers. So he looks around for the lady, and then he sees me--with nothing in my hands. I can see the gears turning in his head. He is thinking I did an end run around him and bribed the counter-granny. So he gets in the register, and he is punching keys all hard--without even looking at them--he is looking right at me--getting his shun on. So Counter-granny comes out of the back and asks me how it looks. I am delighted. On my way out i hold it up and smile at the dude. Couldn't resist. I asked for a copy of Lives of the Saints. They looked at me like I had asked for a copy of Necronomicon for Kids. Thanks heaps, Anon. Now I've got coffee all over my monitor. Ironically, I had to order my Douay-Rheims from the Protestant bookstore because only one Catholic publisher still puts it out and the local Catholic store didn't work with them. But the Catholic store was able to get me a 1611 King James (with the funny spellings and f-shaped S's) whereas the Protestant bookstore had no clue where to get one. Both of them are closed now, leaving the Mormons with the only religious bookstore in town. Part of rebuking is showing a person where they're wrong, and helping them repair the issue. Never does it include mocking that person. This blog, and many of its posters seem to be doing just that. I' not sure if you're the same Anonymous I just answered or not. :) I can't speak for anyone else here, but I don't think this is any sort of either mockery or rebuke. We're laughing at ourselves more than anything. No real malice involved. Those people don't know what they are missing by ignoring the saints. Hagiography is so cool. I love the stories. My favorite is Saint Wilgefortis. After praying for help to rescue her from a betrothal that would have violated her vow of chastity, God comes to the rescue by causing a full beard to appear on her chin making her repulsive to her would be pagan hubby. Marriage called off. Unfortunately, her dad was so pissed that he had her crucified. Win some/lose some I suppose. I love that Catholics have a patron saint for lost causes. I think that's really beautiful. If only they had a patron saint of quality footwear. Another favorite is Saint Lawrence. Now that is a remarkable story. In the 3rd century AD, Lawrence was a sort of caretaker for the Church Valuables. According to legend it was he who sent the grail to Spain for safekeeping. Apparently the prefect of Rome had heard that the Christians had some fancy riches. He approaches Lawrence says that he has heard that Christian Doctrine holds that they should render unto Caesar what is his. Caesar needs dough—so cough it up. Lawrence agrees and asks for time to complete a proper inventory. He gathers the blind and the lepers and the feeble and the afflicted and says to the prefect—These are the treasures of the church. The prefect was really angry, so he had Lawrence grilled alive. Seriously. . . on a grill. I believe this may be the first recorded use of the phrase “Eat me” as an indication of defiance. Oh and I was the Anon who told the Bookstore story. I just did not know how to log in yet! I like you people. You are fun and clever. Stephy, Ss. Crispin and Crispian are the patrons of shoemakers. One would assume that that means quality work. My patron is Augustine of Hippo, because his Confessions made such an impression on me when I was researching the Catholic Church. Then I found out that he's also associated with printers and brewers. If you count homebrewing, I'm both of those. Every congregation has its craziness, but isn't that why the reformation happened? It was the saddest and greatest division to ever occur. It allowed us the freedom to create new constructs within the church, to bring worldview into religion, and to discover theology in the masses. It is also tore us apart and created hatred and fear and disbelief. And then God created postmodernity. And we get to have freedom from choosing sides. I would hope we are all catholics, even if we aren't all Catholics. Then God created intergalactic VD when the lizard men came from Apha Centauri looking for our women,and we all got to be one tribe again united against a common enemy under Pope Underpants I, tra-la-la! I'll have what Mel is having. Make it a double. One of my favorite religious sites is catholicweb.com. They have a feature there called "ask a franciscan" where you can submit a question and they will give the official church answer. They are so nice. Once I asked about the Assumption of Mary. This was declared and infallible church truth by Pius XII in 1950 and holds that Mary was "assumed" into heaven body and soul upon her death. My question was regarding how that squares with the conservation of matter. Was it only the set of atoms that were part of Mary at her death, or all atoms that were ever part of Mary? They confirmed that Pius XII meant just the atoms that were part of her at her death were assumed. All haircuts and fingernail clippings are still here. Once I asked about Jesus's DNA. Did he have 23 chromosomes from Mary and 23 from the Holy Spirit? Was he a male clone of Mary(all 46 from her)? Was mary just the vessel (all 46 from the HS)? They did not have as clear an answer here. All they would say was that he was fully human. I wonder if there was a family resemblance. I have often wondered about Jesus's carpentry. What did he make? Would a Jesus made table be different than a table not made by the son of God? This is going to sound sacrilegious, but I wonder if his carpentry spiked in value in the wake of the crucifixion. I also wonder about what "Fully human" means. I mean did that involve a rebellious youth? Who among us has not wondered about Jesus's missing teen years. What does a 13 year old do with the power of God? Some might say I think too much; I say everyone else doesn't think enough! Becca, See my post way up at the top from aug. 27 on "catholic" and "Catholic." Even many mainline Protestants don't like to say "catholic" in the creed because it reminds them too much of "Catholic." Ahh the dreaded holy sleestack. They confirmed that Pius XII meant just the atoms that were part of her at her death were assumed. A minor picky - the question of whether she actually died or not prior to her assumption is left open. As for hair and nail clippings, I expect those were very transitory, but it's interesting to note that no church claims to have any actual relics of her body, unlike all the other saints. I also wonder about what "Fully human" means. I mean did that involve a rebellious youth? Who among us has not wondered about Jesus's missing teen years. Made like us in all but sin, as Paul put it. (Quoting from memory.) Although the apocryphal Infancy Gospels fuel some interesting speculation. As for the DNA, that's an interesting question. It's possible that the Holy Spirit used 23 of Adam's chromosomes; it would fit with the motif of setting right what Adam screwed up. Still Breathing: I have only a passing knowledge of Taize but I seriously doubted your assertion that there was a dispensation for Holy Communion to be given to all self-proclaimed "Christians", regardless of denomination. There were dispensations for European monarchs to marry their cousins and such but desecration of the Eucharist by giving it to a Protestant would be much worse. Even if you don't believe that the Catholic Church is the True Church of Christ, you must at least admit that they have a right to define their own practices. Many Protestant denominations also restrict reception of their communion to members of their own congregations. So if you go to an LCMS church, say, but say "I'm a Presbyterian but I want your bread and wine anyway", it's rather offensive. And your husband doesn't mind going to a Mass at a Church when the man he follows (John Knox) called the Catholic Church a "Synagogue of Satan" and advocated the mass murder of Catholics and the overthrow of the Catholic monarchy? John Knox called the Mass "idolatry" and said it was worse than poison and that "one mass was more terrible to him than the landing of 10,000 armed invaders". Didn't his ancestors fight and die to oust the Catholic Church from Scotland and now his opinion is "Well, we all worship the same God, right?" Yes, Jesus said, "that they (i.e. all Chritians) may all be one" (John 17:21). That is why the Catholic Church exists. There have always been heretics among the Church, St. Paul warns against them, against following these false teachers. You are essentially saying, "It doesn't matter what people believe, as long as they call themselves 'Christians'". Are Lutherans Christians, how about Mormons or Jehovah's Witnesses or Unitarians or Christian Scientists or Moonies? Muslims created their religion based on Judaism and Christianity, they even believe that Jesus will return to judge the world. Would you count yourself in unity with Charlie Manson (who said he was Jesus), the Moonies and the Muslims because "we all believe in the same God"? Either the Catholic Church is the work of God or the work of the devil. The Protestant reformers declared it the latter, Jesus, Paul and all the saints have declared it the the former. But of a compromise there can be none. The Catholic Church teaches that it is possible that a Baptist can be saved, it is possible that a Mormon or a Muslim can be saved. But if any be saved, all do so through Jesus Christ, in whose Church is the Light of Truth, and who is the Head of Church as of one Body. The idea that taking communion from a different denomination being "rather offensive" is hysterical to me. Offensive to whom? The church or priest, sure. Offensive to God? Not to the God of the Bible. I don't think my husband follows John Knox. Maybe Mark Driscoll does, though. Mary relics? Well presumably it is possible that we have breathed in atoms, oxygen, Hydrogen, nitrogen, carbon, that were once part of Mary. I mean if she respirated and digested like the rest of us--then those atoms are being reused. Possible origin of the phrase Holy S%$#? I grew up Catholic in and Evangelical town. I cannot describe the prejudice I experienced. It horrible. I never got why since we believe in the same God but school was hell for me and I was tortured because I worshiped "idols" and never went more than a few days without being told I was probably going to hell for it...anyway I learned in college that the southern baptist convention at one time boasted huge numbers of members in the KKK.... I was not suprised. I personally would prefer a mass to 10,000 armed invaders. And I don't get the claims of idolatry from the crowd who insist on flag pins, the mandatory pledge, ribbons and fish on your car, and graven images of the ten commandments (one of which warns against graven images). I think the best way for me is to delight in the absurdity of the human condition and be nice and helpful. I think I may be an existential buddhist. Speaking as a whiskypalian, I like the cut of your jib, torcik. Tina, I am so sorry that my protestant brothers and sisters treated you so badly. I know protestant and RC aren't going to agree about everything but it saddens me that we don't make a better job of getting on with each other by concentrating on what we believe in common. My son split up with a lovely devout Roman Catholic girl because they couldn't deal with the differences between their different branches of God's church. That two devout Christians split up because of their shared faith should cause all Christians to grieve. Pilgrim, Catholic = Universal not Roman Catholic. A. Who compiled the Bible? - Cahthlic Church. B. Who was the only church for about 1500 years before King Henry VII decided he wanted to divorce and couldn't so started his own church? - Catholic Church. C. Who kept and died to pass on the faith that you now have? - Catholic Church. Evangelical's calling Catholics wrong or trying to say thier dogma is not correct is a bit like a 6 year old trying to teach his parents calculus. This little page is like the microcosm of Belfast. I'm a newbie here, just followed a link from another blog, but I'll be back. I'm very impressed, both with Stephy's remarkable insights and with the comments. Some of the commenters have made me LOL! I didn't know that was possible when discussing religion! A couple of things: First, iirc, Taize is not a Catholic order. The brothers are part of a lay organization with roots in and deep associations with Roman Catholicism, but they are not part of the institutional Roman Catholic church. So that is why they can share communion with all who show up at the table. Second, catholic, with a lower case "c" is an old word meaning universal. So when the Nicene creed talks about "one holy catholic and apostolic church" it refers to the Christian church which is Holy, found everywhere, and having its authority handed down from Christ to Peter to Peter's successors. Since the reformation, Roman Catholic, capital "C" Catholicism, is a specific Christian church. In the evangelical protestant church, however, salvation is individual, based on ones personal relationship with Christ. If you don't formally accept Christ as your personal savior, it's a no go, no salvation. But in the absence of an institutional church to ponder and guide on the tough issues, since faith is highly subjective, evangelicals have to insist on cultural conformity. The individual demonstrates that they are saved by conforming to what other evangelicals do and say. Evangelicals have to walk a straight and narrow path, lest the individual be contaminated by a non-conformist idea and stray from the path. But it is pretty clear why Catholics/Episcopalians and evangelicals have trouble understanding one another. peacable_tate, I think you may have hit the nail on the head about why non-conformist churches keep creating a culture into which the members are meant to fit. Interestingly, and possibly as a reaction to this, a lot of non-conformist theology is currently influenced by Celtic, and hence the early Orthodox, ideas. It's September 8th. Happy Birthday Mary. I was raised to consider Catholic salvation as "suspect" at best and even went on a missions trip to evangelize Catholics in South America...(to be fair the Catholic Church there wasn't very reconciliatory to the presence of evangelicals in their community). Then one year I got invited to a mass for St. Patrick's Day and I remember my one overwhelming impression was that the people there had a lot more reverence for God than anyone I'd met in my Baptist church...also, hard as I tried, I couldn't actually put my finger on anything heretical in the sermon/liturgy. In fact, I enjoyed _having_ a liturgy so much I later switched to a Presbyterian church, where there's a least a little, and definitely more of an open-minded attitude towards other Christians. I left the church because of Christian culture (and also because I wasn't sure I believed that Jesus was God, but the real main reason was that I was absolutely stifled by the evangelicals I knew and I couldn't stand it one more minute.) A couple years later, I wanted to return, but walking into the front doors of an evangelical church was absolutely more than I could bring myself to do. I became a Catholic because I knew I needed to be involved in a faith community, and that felt like the one church that felt like God was big enough to embrace somebody with as many doubts as I was. I didn't have to pretend to be part of the community. I can't say I've been much of a Catholic since then...but over the last couple of years, I've been making my way back there, slowly but surely. It is impossible to imagine that I will never want to be part of evangelical culture again. Ever. I agree, it's a journey. A long one. :-) I'm not worried. I know God can find me outside of church...and I'm pretty sure that's where s/he'll have to find me since church and church culture is so unappealing to me. And my last post reminded me of another thing Christian culture insists on...that God be referred to with a masculine pronoun. I'm so glad I returned to read your blog, Stephy; I learn so much. It's easy to dislike things one barely or even halfway knows. Non-Catholics have always gotten the saints and Mary thing wrong. But then, since Martin Luther wanted no interpolation between the Almighty and himself, well, away we went. If we separate the thing from the noise it makes, then we may see rather than simply hear. To Joel: You must be the only RC I know who still believes in the "literal" transubstantiation out of your Baltimore Catechism. Everyone else I know views Communion as having changed in use but not in actuality. That is, the bread and wine are no longer merely their own substances, but have changed in to a mystical stand-in for Jesus' body and blood. But not literally blood and flesh...they are still bread and wine. The updated view is rather like that of the Episcopalians. I jest, but it's no wonder in some cultures Catholics still get accused of being baby-eaters! To Still Breathing: Of course, you're welcome at the RC communion table. I can't imagine any RC Church where you couldn't go up to receive Communion if you so desired. Now if the priest actually knows you, which is hardly likely unless he is aware of your heretical non-RC patronage, then he would perhaps bless you but skip the wafer. And there are the self-styled "traditional" RC churches popping up which prefer the old Tridentine Mass format with its talk of heathens and perfidious Jews (Ah, Shylock), and you wouldn't be welcomed, or feel welcomed, at those places. But like the breakaway Episcopalian churches, sometimes it's better to let persons go their own way. The only time I was ever excluded from a church's communion was attending services with a Greek Orthodox friend. The priest specifically forbade non-GO persons from partaking. Had I not been with my friend, I would have partaken, forbidden or not. But I don't care, and for all that priest knew I could have been an out-of-town visitor. But of course the Christian Orthodox communities rely more upon ethnic connection than other Christian groups (like Roman Catholics, a truly "universal" church). And therein they are somewhat more like Judaism than Christianity. I say blessings to all, and especially to Stephy for her fantastic blog. Peter was not the first Pope, Jesus had Brother and sisters, what the "heck" is perk-a-story,which pope owned a fish store ?, and how does not eating chocolate during lent (what's that) help you identify with Christ suffering ? etc. etc. etc. Wasn't Peter Sellers the Pope that one time? Or was it just a dream? 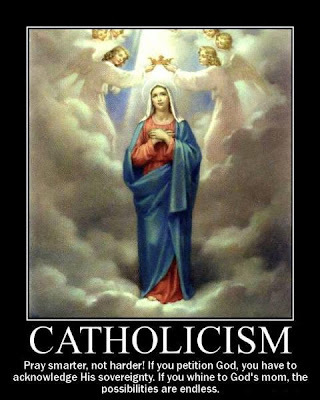 We don't pray to Mary, we pray for Mary to pray with us to god..
That clears it up nicely. Ready for the Scientology post, Stephy. I fully believe that some Catholics are saved, but there are those who belong to the Church simply because it's family tradition. The whole transubstantiation thing still baffles me. How can anyone believe, in this modern age, that wine and bread magically become flesh and blood? When you drink from the chalice, does it taste like blood? Aren't cannibalism and drinking blood considered wicked? Having grown up in an evangelical stronghold of the US, I'm well aware of the suspicion evangelicals hold towards Roman Catholics. In fact, when I mentioned that I now belonged to an Episcopal church, an evangelical friend said doubtfully (and warningly), "Isn't that almost Catholic?" However, now I get to feel how it is on the other side, living in a predominantly Catholic country and engaged to a Catholic man. It pains me that I'm not welcome to participate in the Eucharist whenever I attend Mass with him, not that anyone would ask for my Catholic credentials, but on principle, I won't take it because if I'm not welcome to, then I don't feel I'm really in communion with them. As for the insinstance on the literal and physical transubstantiation of the bread and the wine, it strikes me that here the Catholic Church shares with evangelicals (in their treatment of the Bible) such a tenacious commitment to the literal that the value of the metaphorical and the sacramental is lessened. I think the Eucharist can really and truly be the body and blood of Christ without being literally and physically so. Likewise, biblical narratives can be really and profoundly true without being in any way factual. As my fiance and I try to plan our wedding, we're having to deal with this even more. I want "all who seek Christ" to feel welcome to participate in communion, Catholics and Protestants alike. Oh, and as for the RC Church being the "original" church, I think the Orthodox would have something to say about that! I think reality is that Christianity has always been in a process of transformation and fragmentation. What binds us is not adherence to shared beliefs but the love of God, as demonstrated through Christ. Right? And I've enjoyed all the banter. Great stuff. It's the insistence on insinstance. As a Catholic, I am bemused to see so many evangelicals actually, seriously question that Catholics are Christians. First, until at least the Reformation, there was only the Catholic Church. It was THE Church, fought the Crusades against Islam and founded all of the world's universities (in the case of the Jesuits, it led scientific and missionary exploration of this earth and of outer space). Second, the Catholic Church is the source of the Bible. Because of the authority handed by Jesus Christ to Peter and his papal successors, we Catholics know we have the authoritative teaching on the Bible. Third, every Catholic bishop can trace his lineage to the apostles of Jesus Christ. No other denomination can even approach the Biblical and historical legitimacy of the Catholic Church. Fourth, Catholics prize the Gospel over St Paul's writings. Christ makes it very clear in the Gospel that you will be judged by your works, not just your faith: Matthew 25:31-46. As James 2:14-26 says (James was an apostle, unlike Saul then Paul) faith without works is dead. Ironically, Luther tried to have James' letter removed from the Bible - so much for Bible alone! Overall, one of the reasons that so many Protestants convert to Catholicism is that once they study Scripture and church history, they realise that there is only one true Church, founded by Christ on Peter, aka the rock. Fifth, the Pope has a purple dress and a really really big hat. To the dumbell who started this blog and all those who excepts this dumbell's thoughts, take a good look at the very top pic from the link provided. haha,now lets see if you have any guts. What is this link the dumbell above posted? My visual processing centers are not "excepting" anything. At least most of protestants don't think that their church is the only true church... unlike the Catholics! So it goes both ways. 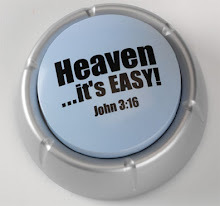 Many Catholics believe that only Catholics go to heaven. Click here to get all the information regarding SSC CGL Notification 2017, Rcruitment, exam dates, exam results, score card. Click here to Check your LIC policy status online by your policy number. Here you can get the complete details about current silver price/rate in mumbai. Know About Online Passport Application Process and Step by Step Process to apply Passport Online. Check out all Washing Machines Under 30000 Price List in India, To get more information click on the below link. Great informative information thanks for this!!! Great and really helpful article! Adding to the conversation, providing more information, or expressing a new point of view of SSC CGL Result 2017 will be announced soon at its main website....Nice information and updates. Really i like it and everyday am visiting your site..